The problem with the “beeriodic table” is that it’s fatally flawed in its execution, and hugely, dangerously misleading, by apparently being based on the BJCP classifications, which, for example, completely ignore the once-important Burton Ale style, evidently because Michael Jackson never wrote about it, so therefore it doesn’t exist. I’ll step back (though I’m sure others won’t) from getting into the “no, German and Belgian wheat beers are NOT ales, nor are lambic and its relatives ale” arguments, and just talk about the area I know best, British beers. 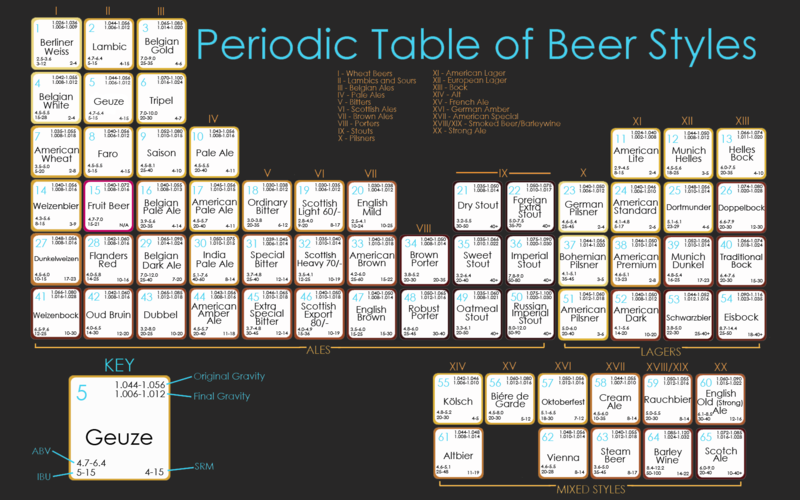 Here, the Periodic Table of Beer is beautifully laid out, but a total mess in the accuracy of the information it is trying to impart: porter and stout are not in any meaningful sense different styles; pale ale is not different from bitter; English milds cannot all be lumped in with “brown ale”, since some are pale, and anyway “English brown ale” covers two completely different styles of beer, the “Northern” and (for ease of description, though they were brewed across Britain) the “Southern”. Scottish “light” is not in the same family as Scottish “heavy”, since one is a mild and the other a bitter. Scotch Ale should not be on its own, but in with the Burton Ale family of bitter-sweet, fruity dark ales, except that style’s not in the table. Old ale and barley wine – well, there’s a complex and lengthy question, and one I intend tackling soon, but certainly they should not be left sitting out on their own in separate families. I’m not sure a “beeriodic table” is even possible, since beer styles are more like a Venn diagram – maybe a multi-dimensional Venn diagram. They overlap with each other, they merge into each other, they link up across “beerspace” in strange ways. Golden ales, for example (which also don’t appear on the Periodic Table of Beer Styles) touch on pale ales on one side and Helles-style lagers on the other, while a beer like St Austell’s excellent Clouded Yellow bridges the space between pale ale and Bavarian Weisse. I’m trying to think of more nice things to say about the Periodic Beer Table: if it gets people realising the amazing variety of different beer styles and types that are available, that’s good, and if it encourages people to try beer styles they’ve never heard of, that’s good too. But if it’s going to mislead people with inaccurate information, then that’s sad: a good deed, flawed. I had a different version of the ‘beeriodic table’ as a t-shirt once. It was just as inaccurate but the nice thing I’d say about it was it was fun. It may be wrong but it is still pretty cool. And the styles presented are correct in gravities and IBU’s, of course using the BJCP 1983 snapshot of beer. The more I thought about the table the more the extended metaphor just didn’t work. Still, it’s nice to have the gravities, etc, to look at. In my mind, still, beer styles remain in flux & ambiguity– no diagram could really contain them statically. Here’s the thing with the BJCP guidelines. They are good for one thing and only one thing. That is judging competitions in which beers are held up to an “objective” ideal before being judged against one another. Beyond that, they are not so useful. That said, anyone familiar with the guidelines and their creators knows that each style category describes a range of flavor, aroma, etc. not a single idealized beer. Your Venn diagram analogy actually works quite well for them. They are guidelines, not rules. Certain styles that aren’t represented, such as Burton Ale, fall into specialty, historical categories. There is a place for them. Also, the guidelines are continually being re-evaluated and get updated every couple of years. Unfortunately a scatter plot doesn’t look as cool on a tee shirt. I think “aperfectpint” said it well when describing the BJCP guidelines for the purpose of competitions. It reminds me of the debates in biology and chemistry, so, in a sense, it’s accurately relating the flux of information. In my 36 years, the biological “family tree” has been adjusted, revised, and revisited multiple times in order to acknowledge new life forms that defy explanation. The chemistry table of the elements did not just spring into being. There were lots of starts and as physics of the elements were understood, the expectation of certain elements became reality, and some subtle changes had to happen. I disagree with the characterization by “Laurent Mousson” that people who adhere to the guidelines are afraid of change. It’s human nature to label things in order to understand them. Some hide behind those labels, but I have rarely met a BJCP judge who does not acknowledge the inherent flaws in the system. It’s “pretty good” not “perfect.” Many of those people are the ones pushing the boundaries outside of guidelines. They hardly seem scared to me. The BJCP guidelines aren’t “pretty good”, they are at best misguided. If “pushing style boundaries” means thinking up new artificial “styles”, then yeah, they do that. For anyone wanting to study the world’s different types of beer, their history and their relationship to each other they are totally, totally useless. The BJCP style guidelines have moved on a bit since the ones that this ‘beeriodic table’ are based on were released and many of the problems that Martyn has identified have been fixed. However the BJCP guidelines’ main purpose is for organising American homebrew competitions. Thus some beer styles are not included, despite being loved by millions – umqombothi comes to mind. The styles included are largely those that American homebrewers enter into competitions. That being said, I am not aware of a better taxonomy of beer styles. I dont think it’s fair to so easily discount this beeriodic table for the reason that styles overlap. Elements in the periodic table are grouped by how similar they react to redox reactions. Potassium and Sodium, while different atomic weight and thus carrying different charges, respond similar in redox situation because they have the same number of electrons in their outer valence. The same is said for the ‘inert’ gasses, argon and neon and such, since they have full valences but different atomic weights. A comparisson could be drawn towards your example of the Golden Ale and Pale ale. They are different styles, but carry with them similarities to other, nearby styles, much like our elements in our periodic table. The content of the chart was created about nine years ago, as far as I can tell. I’ve actually seen the original poster in a number of bars in Europe and the United States, so I’m a little surprised that everyone is talking about this chart as though it’s new. It seems like some people might just want an excuse to take a shot at the BJCP, not that I really disagree. I’m not saying that the criticisms of the chart are invalid, but it’s all a bit too easy, in my opinion, given the age of the chart and its lack of updates by the author. Also, Mantis Designs was/is a gimmicky poster company with no illusions of authority in the world of beer judging. Ok, I now see that the chart is quite close to the 1999 version of the BJCP guidelines.